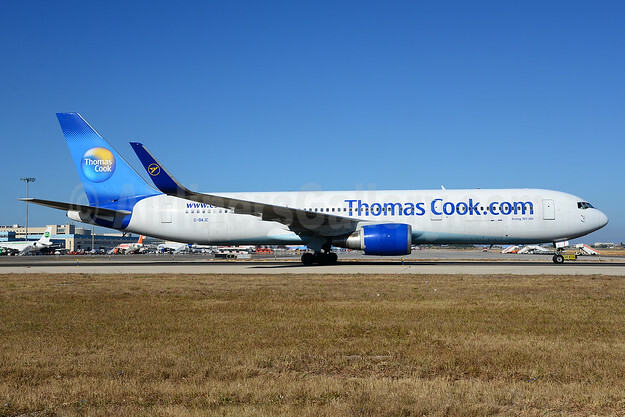 Thomas Cook Airlines (UK) has quietly stopped operating its last two 326-seat Boeing 767-300s (G-DAJC and G-TCCB). Both aircraft have not operated since November 2, 2017 and are now parked at Manchester minus any titles. The airline has not made any official announcement. Sister airline Condor of Germany will continue to operate the type. Copyright Photo: Thomas Cook Airlines (UK) (Thomas Cook.com) Boeing 767-31K ER WL G-DAJC (msn 27206) PMI (Ton Jochems). Image: 913330. This entry was posted in Thomas Cook Airlines (UK) and tagged Boeing 767-31K ER WL, G-DAJC, msn 27206, PMI, Thomas Cook Airlines (UK), Thomas Cook Airlines (UK) (Thomas Cook.com) on November 18, 2017 by Bruce Drum.